The two cities share many similarities: ports that opened to the great powers (Yokohama in the 1850s and Kobe in the 1860s), historical houses for foreign residents, China towns, and perhaps an exotic atmosphere. To our family, Yokohama and Kobe are very close to each other simply because my wife’s parents live not only in Kobe, but also in a newly developed residential area called “Seishin new town”, very much similar to our “Kohoku new town”. Having said so, now I would like to show you some photos of Kobe from my album when I visited there in May, 2010. 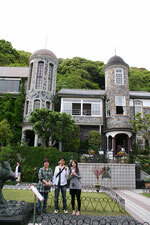 Standing in front of a historical house is my wife on the left, my elder son and his wife. The house is popularly called “a house of fish scales”, because of a particular slate used for the outer walls. Anyone can recognize this: China town. It is said that about 10,000 Chinese live in Kobe but mostly outside of China town, whereas Yokohama’s 6,000 Chinese live mainly in and around China town. This partly explains why China town in Yokohama is bigger than that in Kobe. Showing typical scenery in Kobe with mountains in the background and the commercial area facing the sea. I was amused to see signs inside a department store indicating “This way to the mountains” and “This way to the sea”. A ropeway ride in rain to a hill-top park overlooking downtown Kobe. Beyond the left side of this photo is New Kobe Shinkansen station. Another popular historical house is known as “a weathercock house”, which belonged to a German trader.